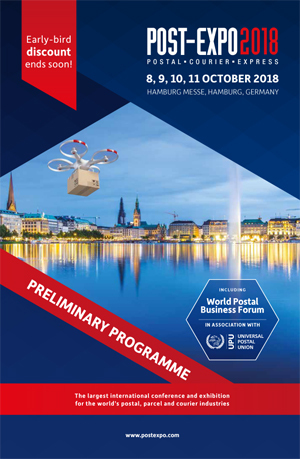 POST-EXPO, the world's leading international postal and parcel industry exhibition and conference, heads to Hamburg in October 2018. With more than 3,000 people attending each year, 160 international exhibitors and four days of expert speakers debating and discussing the industry's key issues, POST-EXPO is delivery's global meeting place. The show has been running for nearly twenty years, providing an annual event for the world's postal operators; but do not be deceived by the name. Following wide-ranging changes in the industry, POST-EXPO has developed and expanded to cover broader aspects of the industry; including e-commerce, express couriers, logistics operators, cross-border shippers and all those whose business it is to keep the postal and parcel world moving. The free-to-attend exhibition is the world's largest annual postal and parcel exhibition. It provides an unbeatable opportunity to get a first-hand look at the latest innovations and technologies driving this industry forward. From parcel sorting and dimensioning to digital marketing and e-commerce solutions; from last-mile delivery innovations to network services; returns solutions to air cargo transport and much, much more to keep your business at the cutting edge. Explore the full list of exhibitors here, ranging from industry-leading partners to brand-new startups. The POST-EXPO Conference is always a superb learning and networking event, featuring a host of expert speakers from postal operators, courier and express companies, e-commerce logistics companies as well as companies involved in developing and implementing the latest technological solutions in automation and delivery. This year, the exhibition also has a full day entirely dedicated to the Universal Postal Union's World Postal Business Forum. The conference will feature sessions on the increasing challenges of logistics, particularly in urban areas, including innovations and options in the last mile. With digital disruption now a feature of most industries, the conference will also directly examine the advances in autonomous delivery and logistics, robotic automation and the future opportunities for drone delivery! With exhibitors from around the globe and four days of expert conference speakers, POST-EXPO is an unmissable event. Join POST-EXPO in Hamburg and drive your business forward.